If you have a database driven application which reacts very slowly when the data increases, then you are right in this webinar! 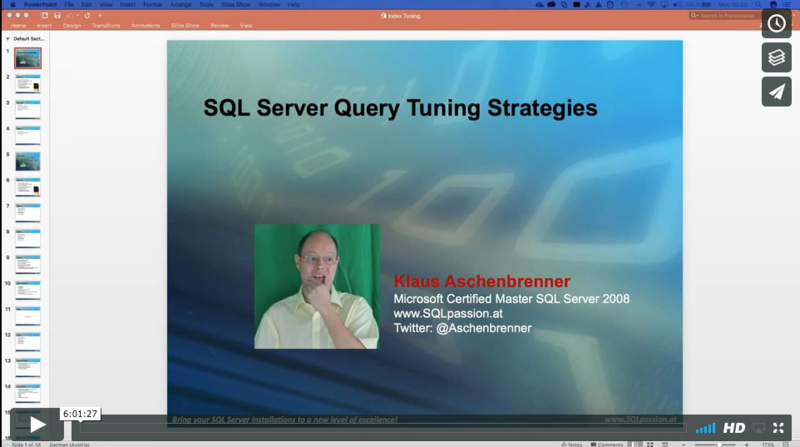 In this webinar you will learn, how you can tune SQL Server Queries with concrete Index Tuning Strategies. You will also see how SQL Server caches and reuses Execution Plans, and which terrible problems can occur in SQL Server based on this behaviour. If you want to become a SQL Index Tuning Expert you can attend this 1 day long deep-dive webinar for only EUR 590 + 20% VAT on January 25, 2018! This 1 day long webinar is primarily for DBAs, Developers, and Consultants who want to speed up their SQL Server installations with Indexes. You don’t need to know anything about Indexing, you just need to have a basic understanding how to write T-SQL queries and stored procedures for SQL Server. After registration, we will send you the invoice via email.